Hiperbaric has a team of highly qualified engineers that give effective answers to our customers’ needs. For this, we have an excellent 24/7 hotline service, an interactive and intuitive online platform called After Sales Portal Hiperbaric. At Hiperbaric, we are extremely committed to bring any time and anywhere, what our customers need so we can meet customer’s expectations. For this, we have a team of highly qualified engineers that give effective answers to these needs. They provide a 24/7 hotline service to help our customers and they do it through three Service desks distributed around the world that can be contacted by email or phone. 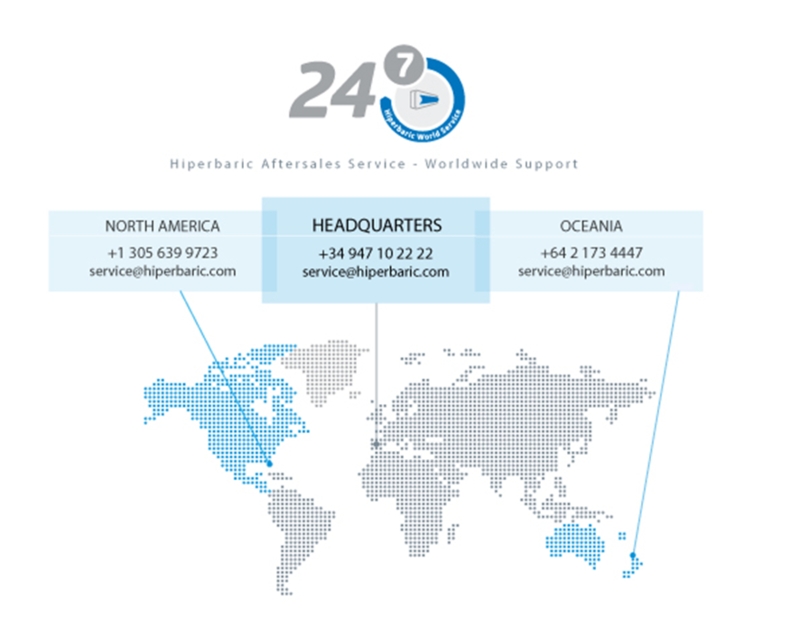 Hiperbaric 24/7 is a service that our clients value very positively and, largely because of our versatility. A very clear example is our after sales portal, which we are continuously improving to make things easier for our customers. 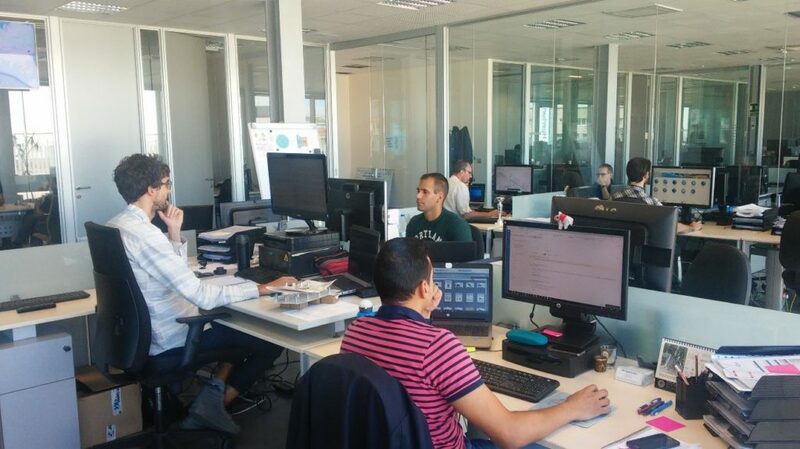 It is equipped with some interesting and didactic tools, which highlights the creativity and empathy of our technical team. 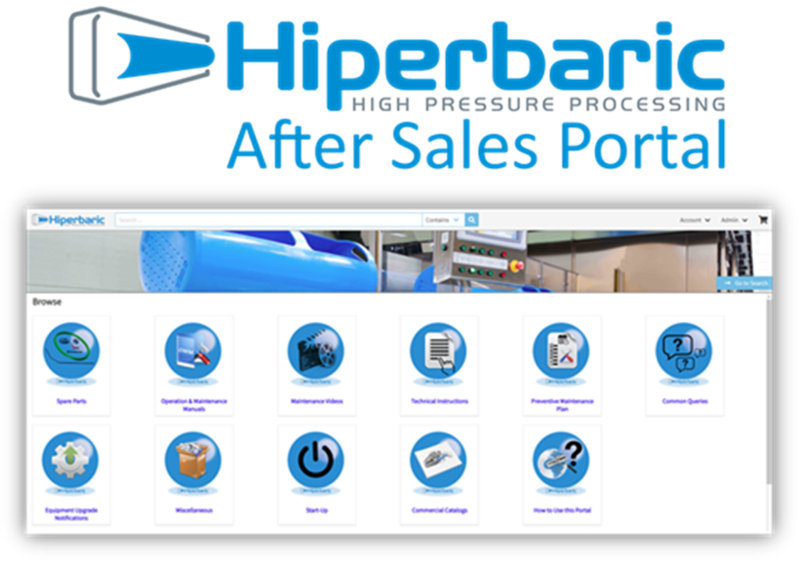 After Sales Portal Hiperbaric is an interactive and intuitive online platform, specially developed to help our customers to maximize HPP-machine up time. With credentials assigned by Hiperbaric, safely and with confidence, our customers have quick access to a lot of technical information that will advise and help them with the most common maintenance issues they could find in their equipment. Parts Catalogue: Allows an optimal managing of the process, ordering spare parts for the HPP equipment. Customers can navigate through a specific interactive 3D manual to locate the spare parts they need and to add them to the shopping cart quickly, just by clicking on it. Possibility to check item prices in real time (without the need to request an offer each time). Orders come into Hiperbaric ERP system at real time, optimizing deadlines. Cloud Library: Availability of large amounts of centralized technical information, from any device with Internet access. Machine manuals (PDF version and Interactive 3D OMM – Operation and Maintenance Manual. Catalogue with all spare parts available. Common queries that support to solve some bassic issues. Publication of equipment upgrade notifications which are being producing, if apply. Technical Instructions regarding different maintenance operations. Training videos to perform usual maintenance operations. Commercial catalogues of Hiperbaric machines. Specific technical documentation regarding some applications of the HPP technology. As a specific example of these advantages and highlighting the versatility of the after-sales team, we would like to invite you to visit our YouTube channel, High Pressure Processing (HPP) equipment. These videos always make work easier to our customers.